Additive manufacturing is the process of printing three dimensional objects one very thin layer at a time, turning digital 3D models into physical 3D models – out of materials such as: plastic, metal, ceramic, and even glass. In the video link below, they even discuss how a very large 3D printer is being utilized to print replacement sections of the Great Barrier Reef out of cement…something that I would have NEVER thought of. 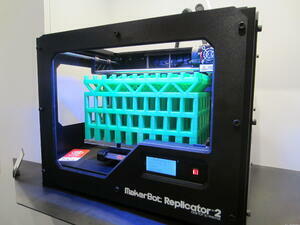 In fact, I find myself surprised more often than not by most of the applications where 3D printing is being utilized. Invented in 1984, additive manufacturing technology has grown into a $22 billion dollar industry worldwide…according to Wohlers Associates. It is now being utilized by almost every industry that you can think of, in one way or another - architecture, construction, industrial design, automotive, aerospace, military and defense, engineering, dental & medical, jewelry, and education to name a few, and the list of industry applications is growing every day. Helping to spur this accelerating growth in utilization and application is the fact that prices have dropped dramatically over the past few years - and are now hovering around $2,000 per unit. With printers becoming more economically available to the average consumer, and as these units are capable of printing 3D models with an expanding list of media and materials, it has now opened the door for hobbyists, schools, technical colleges, small business, and even some homeowners to begin experimenting with this technology…something that I feel will help drive the change in the way families will purchase many everyday items in the near future. I believe the days of traveling to your local store to purchase common household items might be coming to an end; or at least drastically changing in the near future. Things like cell phone cases, replacement game pieces, broken or missing parts from furniture or hardware kits, hairbrushes, children’s toys, etc… will simply be downloaded and printed at home. Even items like orthotic shoe inserts – provided there is a 3D model “prescription” available – can be printed as needed whenever a new pair of shoes is purchased. Even controversial and hard to find items such as gun parts and functioning ammunition magazines are now available to download and print at home. The list of possibilities is endless! As I mentioned before, this technology can’t do everything - and I just don’t see it becoming the replacement for traditional manufacturing processes as many have speculated. However, I do see this technology changing and impacting our everyday lives in ways that we cannot even imagine at this point. Think about the fact that the iPhone and iPad didn’t even exist 6 years ago. Think about how much that technology has changed or impacted your life during that short period of time. I believe additive manufacturing will do the same…and I am very excited to see just how much.